The man who created Bananas Gorilla with his armload of watches, Sergeant Murphy blowing his whistle, and Mr. Fixit with his chest of tools, was — in his early years — a Ridgefielder. Many kids who grew up from the 1960s onward knew the creations of Richard Scarry. Huckle Cat, Lowly Worm, and many other characters from his pen have been friends to tens of millions of children. “Scarry revealed to kids that the everyday world was a place that could be understood — and that learning was fun,” said one biography of the author and illustrator. Born in 1919 in Boston, Richard Scarry dropped out of business school and then studied at the Museum of Fine Arts School in Boston. After serving as an Army lieutenant during World War II, he became a freelance artist in New York City. In 1950, he illustrated Katherine Jackson’s “The Animals Merry Christmas” for Simon and Schuster, and a career was born; first editions of this 19-cent book can fetch hundreds of dollars today. In February 1951, he and his wife Patsy moved to Ridgefield from New York City, leasing a place on the Conklin farm on North Street — a locale that inspired many of his later farm illustrations. In 1953, the couple bought their first home, also on North Street. The Scarrys could often be seen driving around town in their MG sports car. Throughout the 50s he illustrated books for Golden Press. In 1955, he did Jane Werner’s “Smokey the Bear,” a Golden Book. Many of today’s images of Smoky the Bear are based on Scarry’s imagining of him. 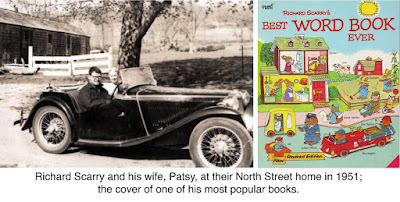 In 1953, their son was born; though they named him Richard Jr., he was always called Huck — like the Busytown cat who would follow — and today Huck Scarry produces children’s books himself. In 1959, the Scarrys moved to Westport, and 10 years later, to Switzerland. Scarry’s first major success as an author illustrator was “The Best Word Book Ever,” published in 1963, which introduced Busytown; it sold more than seven million copies in its first 12 years. Over his 26-year career, he did more than 300 books that have sold more than 100 million copies in 30 languages; scores are still in print. He died in 1994 in Switzerland at the age of 75. His papers and much of his art are now in the University of Connecticut archives. Huck lives in Vienna.